John W. Barriger III took this photo of Tower 139 from the rear platform of his business car during a trip to Houston in the late 1930s. His train, northbound on Houston, Belt & Terminal (HB&T) tracks, had left Union Station and crossed the single-leaf steel bascule bridge over Buffalo Bayou. From this view, the tracks of the Texas & New Orleans (T&NO) railroad pass in front of Tower 139, crossing the HB&T at a right angle in front of the bridge. Historic documents in the collection of DeGolyer Library at Southern Methodist University explain that Tower 139 was built as a replacement for Tower 89, but Tower 89 remains a mystery with its construction, location and ultimate fate unknown. 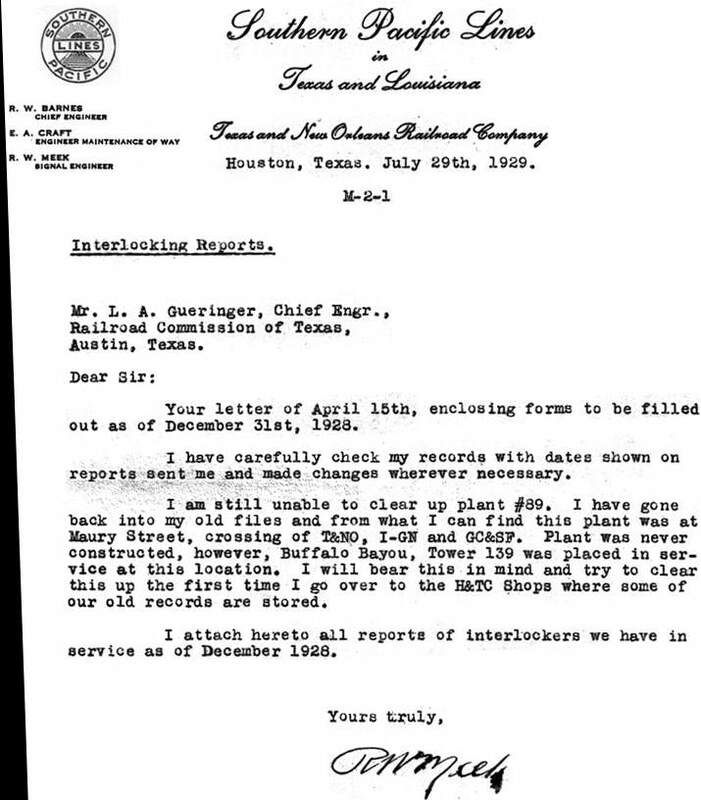 Towers 89 and 139 in Houston present an interesting mystery that can be traced back to 1912 when Tower 89 first appeared in the list of authorized interlockers published by the Railroad Commission of Texas (RCT). In a table dated October 31, 1912, Tower 89 is identified as a 12-function mechanical interlocker serving a junction of the Gulf, Colorado & Santa Fe (GC&SF) and Galveston, Harrisburg & San Antonio (GH&SA) railways in Houston. Although, no operational date was listed, this was not uncommon. Sometimes, a tower was close to being operational and had been assigned an interlocker number, but was not yet in service at the time the RCT report was produced (for example, Tower 90 in Victoria in the same report.) In the annual reports for the next two years, tables dated October 1913 and October 1914 continued to list Tower 89 as an interlocker with no operational date (and, oddly, the date for Tower 90 also continued to be omitted.) In the next annual report, in a table dated October 1915, Tower 89 was completely omitted (and the correct date, January 3, 1913, for Tower 90 was added.) A few years later, Tower 89 reappears, this time in a table dated December 31, 1919 listing interlockers that have been "abandoned on account of removal of crossing". In this list, Tower 89's authorization date is reported vaguely as "1912" whereas the other towers listed have precise dates. Tower 89 continued to be described this way until RCT stopped publishing interlocker tables. So...where was Tower 89? In 1912, the GH&SA was a major component of Southern Pacific (SP) operations in Texas and had not yet been merged into the T&NO, SP's primary operating railroad for Texas and Louisiana. They owned a line along the north bank of Buffalo Bayou that paralleled Clinton Drive; Tower 5 was located along these tracks. Closer to downtown, a crossing of both International & Great Northern (I-GN) and HB&T tracks was required to connect with SP lines further west. The HB&T trackage in this area had been transferred from Santa Fe when four Houston railroads combined to create HB&T as a switching railroad in 1905. Depending on the precise line of demarcation between GC&SF and HB&T track ownership (e.g. 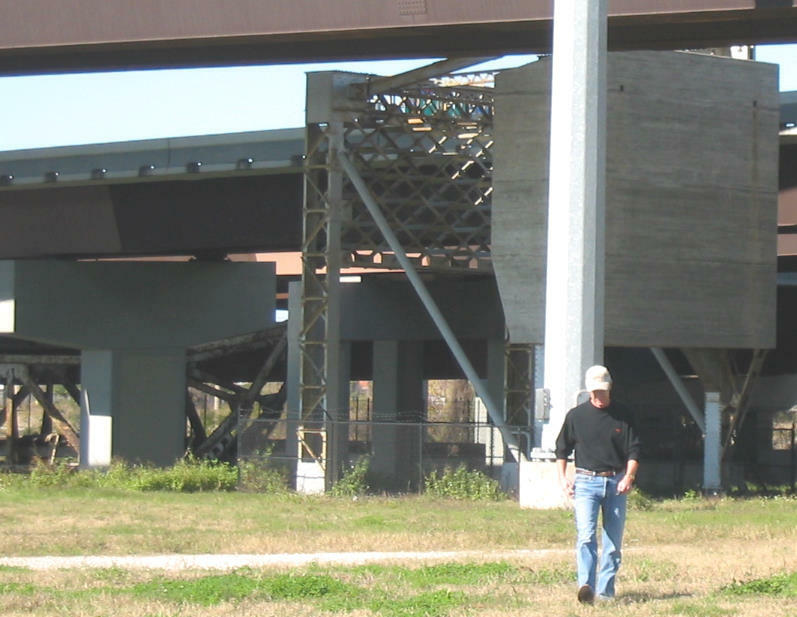 perhaps the north end of the HB&T bridge over Buffalo Bayou? 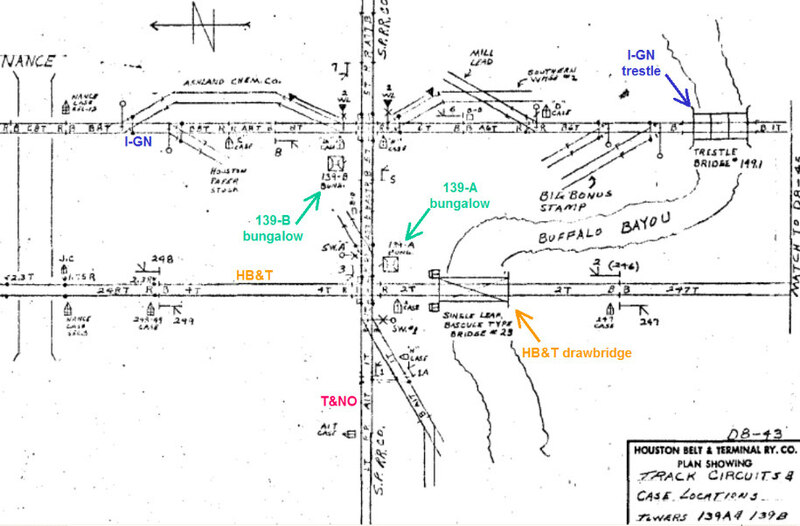 ), it is possible that the original crossing involved Santa Fe (as listed for Tower 89) rather than HB&T. Was this crossing the location of Tower 89? As shown by the letter below dated July 29, 1929, seventeen years after Tower 89 should have been placed in service, neither RCT nor SP knew for certain where it was! Above: This letter to RCT's Chief Engineer from SP's Signal Engineer, R. W. Meek, is the only item in the Tower 89 file at DeGolyer Library. It suggests that Tower 89 was never constructed and that Tower 139 was later built for the same purpose. Below: This annotated image from the 1907 Sanborn Fire Insurance index map of Houston shows the rail junction on the north bank of Buffalo Bayou that eventually became the location for Tower 139. Yellow lines are SP (T&NO or GH&SA), red lines are I-GN, and the green line is H&BT. After 1907, but probably before Tower 139 was built, the HB&T line was extended due north paralleling the I-GN and SP lines to the major junction at Towers 25 and 26. Tower 139 had been in operation for about seven months when the letter was written in the summer of 1929. 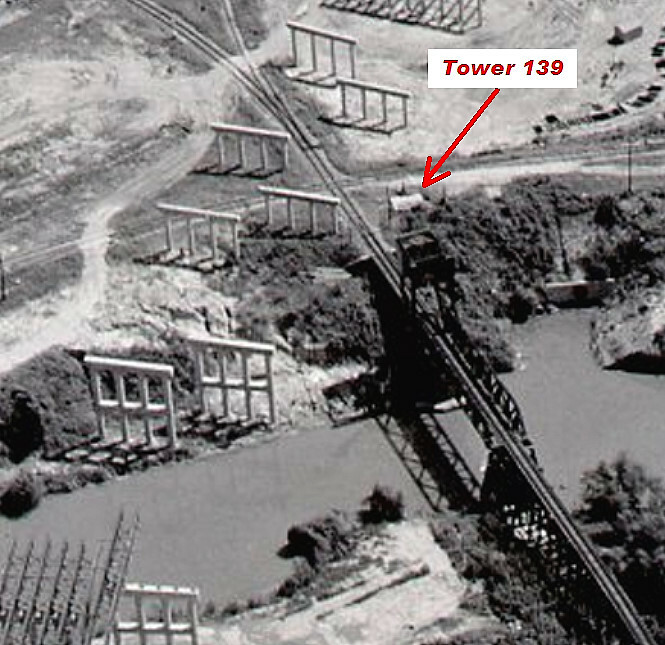 The letter references "Buffalo Bayou, Tower 139" leaving no doubt about the tower location and confirming the tower identity in Barriger's photo (the three-digit tower number placard in the photo is visible but illegible under higher magnification.) Unfortunately, the author's reference to Tower 89's location, "...this plant was at Maury Street...", is significantly problematic since the closest possible location of Maury Street was at least 1,000 ft. from where Tower 139 was actually built (Semmes Street, for example, would have been a closer street reference.) There was a Maury Street location that became interlocked as Tower 207 in 1956, but this location would not have involved GH&SA or GC&SF in 1912, and it was at least a half-mile from where Tower 139 was actually built. Notwithstanding Meek's reference to Maury Street, it seems unlikely that Tower 89 was related to Tower 207 or otherwise associated with Maury Street since Tower 139, at Buffalo Bayou, was "...placed in service at this location. ", i.e. the intended location of Tower 89. There is, however, other evidence that suggests a very real possibility: Was the Tower 89 structure actually constructed but the interlocking plant never installed? 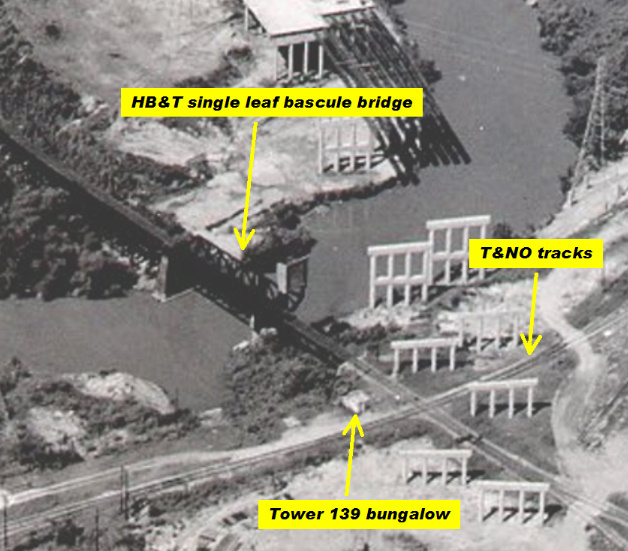 As the Barriger photo shows, Tower 139 was next to the north end of the HB&T bridge over Buffalo Bayou. Four years before Tower 139 was authorized, the 1924 Sanborn Fire Insurance Map of Houston (below left) showed a structure in precisely the same location. Under magnification (below right), the structure is revealed as a two-story "OFF." (office) with a door on the east end. Why would a railroad build an "office" in a remote area far from any yards or other facilities, but conveniently near a bridge and a crossing diamond? And why would it be two stories when such a remote site would be unlikely to need space for more than a handful of employees? Rather than an "office", it is more likely that this building was, in fact, the original Tower 89 structure presumably serving (or having served in the past) some limited operational control purpose without its planned interlocking plant. And what about the "A." notation on the map; does this mean "Abandoned"? There is much that remains to be discovered about this structure. The 1907 Sanborn map shows east/west I-GN and T&NO tracks crossing the HB&T at this location. and this is at least partially consistent with the original description of Tower 89, which omitted reference to I-GN. However, we know from later track diagrams that Tower 139 eventually controlled the I-GN/GH&SA crossing to the east. Surely there was some kind of "operating procedure" for GH&SA trains to cross both the HB&T and I-GN tracks in this area? It does seem odd that Signal Engineer Meek would not have known about the history of the structure at this location, especially since Tower 139 had been in operation for seven months and would have been planned well before that, but there are plausible explanations that might apply. First, it seems likely that the personnel at this "office" might have been HB&T employees, not SP, so Meek may have had no direct exposure to its operation. Furthermore, the original Tower 89 interlocker documentation might have been held by HB&T or Santa Fe, and thus does not appear in Meek's files (but Meek's "...still unable..." comment implies that this is not the first time this subject has been discussed with RCT, which also apparently lacked documentation.) It's also true that Meek's letter was written at least five years after the 1924 Sanborn map was published, and we do not know for certain that the structure survived past 1924, or whether it had already been abandoned by 1924. The extent to which the 1924 structure survived and how (or whether) it morphed into Tower 139 remains unknown. Tower 139 first appears in RCT annual reports in 1929 as a 36-function electrical interlocker that opened on December 20, 1928 involving HB&T, T&NO and I-GN. This is consistent with the 1924 Sanborn map, but by the time of the Barriger photo (~ 15 years after the Sanborn map), it appears that only a single T&NO track was crossing the HB&T at this junction. The I-GN reference could indicate that their track was still in place in 1928, and/or that Tower 139 was designed to control the I-GN/T&NO crossing a short distance to the east. An employee timetable for any of the railroads that operated in this vicinity dating to the 1912 - 1929 timeframe would be very valuable, but we have yet to obtain such information. SP's timetable for the "Beaumont Division and Terminals Division" dated September 7, 1930 is available from the History Center in Diboll, but as expected, it shows Tower 139 as an integral component of traffic management. The History Center also has a 1926 SP timetable for the Beaumont Division, but since it omits the Terminals Division, it does not cover the Tower 89/139 junction. RCT files state that Tower 139 took over the Tower 5 interlocker controls in 1940, but we do not know how much beyond that date Tower 139 survived as a manned tower. Above: This image is an excerpt from an undated photo in the Texas Dept. of Transportation archives. The photo is probably from late 1960 or early 1961 based on the freeway construction in progress. 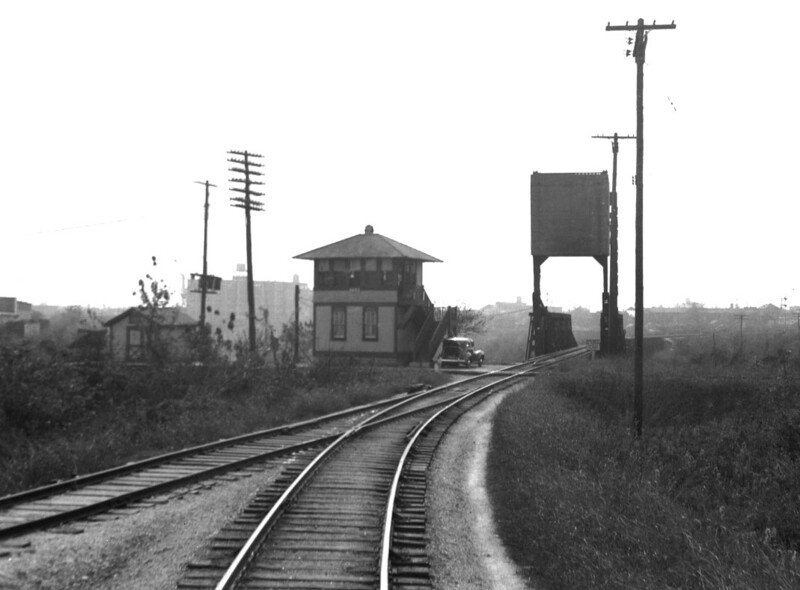 The Tower 139 "bungalow" (as referenced on HB&T track charts) appears to be visible near the crossing. Below: A similar photo taken at the same time but facing northeast shows the Tower 139 "bungalow" structure more clearly. Below: The 139-B bungalow referenced in the above chart is visible as a traditional cabin interlocker in this photo of the I-GN/T&NO crossing located on the north bank immediately east of the HB&T bascule bridge. This image is from the same TxDOT archive photo facing northeast that shows Tower 139. 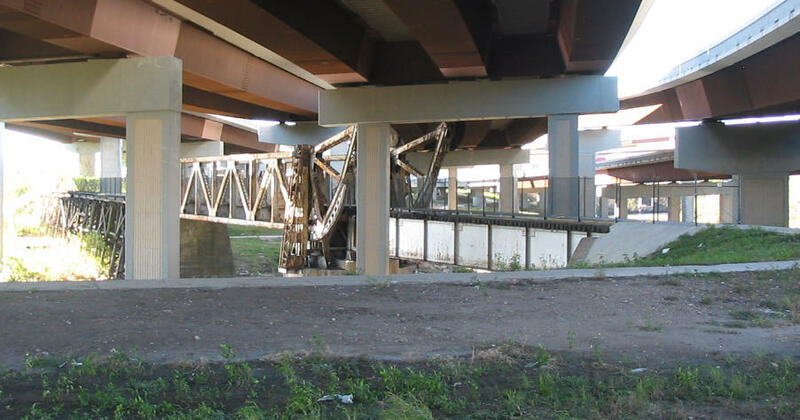 Above: The 100+ year old HB&T steel bascule bridge remains intact across Buffalo Bayou, hidden from the public by the maze of freeways crossing overhead. The original Tower 139 was probably located in the foreground of this photo. There was no evidence of a foundation or structure apparent at the site. Note the minimal clearance between the top of the rotation arm for the bridge and the freeway overhead. Clearance issues required the massive counterweight structure to be dismantled. Rather than discard it, it was preserved on a new concrete foundation surrounded by a barbed-wire fence (below) near the bridge. Thanks to John Davis (pictured) for providing transportation to this and other tower sites in the Houston area! 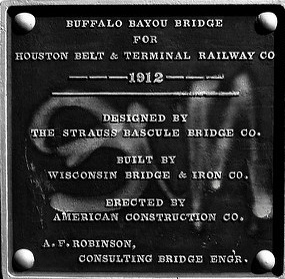 This plaque recognizes the construction of HB&T's Buffalo Bayou bridge in 1912. It was posted on the fence that prevents people from crossing the bridge from the nearby Buffalo Bayou Hike & Bike Trail. As of the summer of 2018, work was underway to convert the bridge for pedestrian use. The bascule bridge was converted for pedestrian use at some time in the past, but is now fenced off. 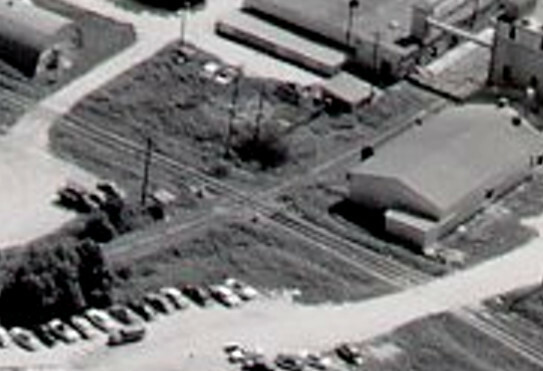 This satellite image, captured before freeway construction completely obscured the site, shows that most of the rail lines that comprised the Tower 139 junction have been abandoned. Last Revised: 1/25/2019 JGK - Contact the Texas Interlocking Towers Page.